I’m thrilled to be part of the Wheaton Art Festival, on Friday, November 13 at Chuck Levin’s Music Center (Performance Space), at 11151 Veirs Mill Road, in Wheaton, Maryland. This juried pop-up art event is part of the Wheaton Arts & Cultural Series. 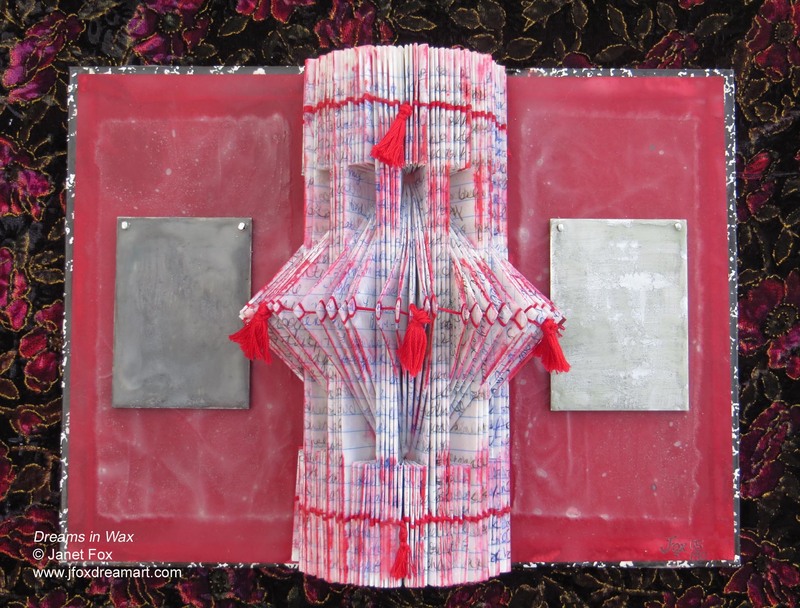 My entry Dreams in Wax, is part of my series of 3-D art pieces incorporating dream journals. I began studying my dreams about 20 years ago. About one third of my studies have been in dream group settings; the rest, a solo endeavor. This practice helps me discover my authentic voice, the one from somewhere deep within. This voice speaks in a unique, rich inner language of symbols. I trust that these dreams come to help me become a whole person. And while I’ve explored personal meaning in a group setting, I’ve also seen others use my dream themes and symbols as a sort of mirror to project their own ideas. This is similar to a group of people viewing one piece of art while each seeing different things and feeling different emotions. I find that dream study connects me to others in wonderful and inspiring ways, enlivening my life. I began this piece with a journal from back when. I decided to fold in the pages, covering them in encaustic medium as a way to preserve the pages. I also sewed the pages together, perhaps to not reveal too much. The red tassels represent the “loud symbols” that can show up in a dream. These are the ones that are packed full of emotion, brightly colored, shocking or jump out at me in a way to require further reflection. The rectangular window on the inside of each cover represent dreams as windows into an interior world. I mounted the journal on a rich brocade velvet, reminding me of the richness of dreams. The entire piece is inside a 4 inch frame, again a sort of window looking inside to find something beautiful. How do You Relate to Your Dreams?